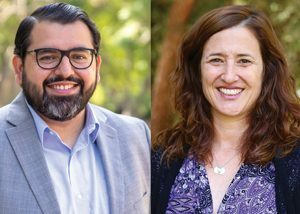 Laura Abrams, professor and chair of UCLA Luskin Social Welfare, and Sergio Serna of the field education faculty received a one-year policy practice in field education grant from the Council on Social Work Education totaling $18,500. This grant will enable Social Welfare students and faculty to make closer ties with local child welfare agencies to advocate for youth aging out of foster care, to learn more about the policymaking process and to forge lasting community relationships. In a community where Latinos are about 50 percent of the population, Spanish skill is invaluable for social welfare students. Luskin Social Welfare Field Education faculty members Sergio Serna and Hector Palencia MSW ’08 are doing more than teaching Luskin students the language, however. They are implementing a Spanish course geared specifically toward communication in the social welfare field. Prior to the start of spring quarter, Serna and Palencia interviewed a pool of applicants in order to ensure that students could understand and converse in Spanish. Their goal was to create a class where students could learn and practice Spanish in the context of social welfare. Having worked in the social welfare field for more than 10 years, Serna and Palencia designed the structure and content of the course with their own experiences in mind. The course emphasizes development of practical knowledge — teaching the words and phrases most applicable to social work, as well as training students to overcome communication challenges that Serna and Palencia experienced firsthand. Cotta applied for this course in order to learn Spanish social welfare terminology that he could apply to his internship at LAMP Community, a Skid Row-based nonprofit. Each week, guest instructors come in to teach and discuss their areas of expertise with the class of 18 students. Rather than following a traditional lecture format, the class uses an intimate roundtable setting to encourage conversation and discussion between students and the instructors. “This class is more of a conversation, which eases the stress and anxiety of being in a new, awkward situation when practicing language.” Palencia said. In the future Serna and Palencia hope to expand the diversity of the course content by including students and instructors from Public Policy and Urban Planning. Luskin students who are interested in applying for the course can contact Serna at srserna@luskin.ucla.edu.